Iran's new envoy to the IAEA says Tehran has a "strong will" to talk about its nuclear program, but won't give up its "nuclear rights." Iran's new envoy to the UN atomic agency said on Thursday that Tehran had a "strong political will" to engage with the international community over its nuclear program, reported AFP. But, speaking at the International Atomic Energy Agency (IAEA), Reza Najafi said diplomacy was a two-way street and that Iran would never give up its nuclear "rights", echoing new President Hassan Rouhani. "I would like to emphasize that there is strong political will on the Iranian side to constructively interact," Najafi told a meeting of the IAEA's board of governors. "We hope there would be the same approach and political will on the other side. In this context, we should not lose sight of the fact that interaction is not a one-sided road," he said, according to the text of his remarks quoted by AFP. Hitting out at Israel's "clandestine nuclear weapons program", Najafi said Iran's nuclear program "has always been and continues to be exclusively for peaceful purposes" and that Tehran would never relinquish its "right" to peaceful atomic activities. Speaking to reporters outside the closed-door meeting in Vienna, Najafi said he did not want to "pre-judge" the outcome of a meeting with the IAEA on September 27 but that he "hoped" it would be successful. The IAEA will press Iran to address allegations that until 2003 and possibly since it conducted research on nuclear weapons. Ten previous meetings since early 2012 with Najafi's predecessor, Ali Asghar Soltanieh, failed. 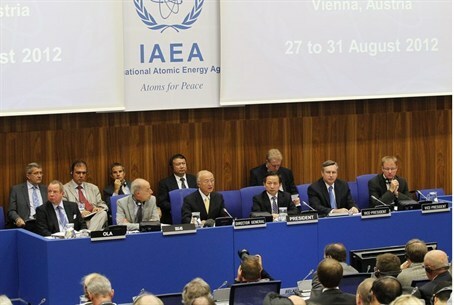 An IAEA report released at the end of August found that Iran has further boosted its capacity for uranium enrichment. The report said that Tehran has now installed more than 1,000 advanced centrifuges at its Natanz enrichment plant. The United States said on Wednesday it was seeing "troubling developments" in Iran's nuclear program and called on the country's new president to take concrete steps soon to ease concerns about Tehran's aims. The U.S. envoy to the IAEA, Joseph Macmanus, said Washington was ready to work with the new Iranian government "to reach a diplomatic solution that will fully address the international community's concerns" about Iran's nuclear program. Rouhani’s election in June as Iranian president has raised hopes that the talks, as well as parallel diplomatic efforts with world powers, will make progress after a decade of no success and rising tensions. Rouhani on Tuesday said that Tehran would not give up "one iota" of its nuclear rights, repeating a mantra frequently used by his more hardline predecessor Mahmoud Ahmadinejad. He also said that the time for resolving Iran's nuclear dispute with the West was limited, urging the world to seize the opportunity of his election. The UN Security Council has passed six resolutions since 2006 calling on Iran to suspend the most sensitive parts of its nuclear program because of suspicions that it is aimed at getting the bomb. Israel's ambassador to the IAEA, Ehud Azoulay, told the Vienna meeting meanwhile that Iran "is leading the entire world community around in circles ... to conceal the true military nature of its nuclear program." He added that "an evil regime is about to turn into a nuclear-armed evil regime."